When it comes to home gardening, tomatoes are one of the plants that everyone seems to want to grow. They are nutritious, delicious, and you can grow a lot of them in a small amount of space. You can make them into salsa, sauce, salad, and soup or slice them and eat them raw. There is almost no limit to the ways in which you can use this very versatile veggie and we have many recipe options on our recipe site on Fill Your Plate. Unfortunately, the very thing that makes it great to be a gardener here in Arizona, the climate, can also make it difficult to grow tomatoes. Here are some helpful tips for how, when, and where to grow tomatoes. While home gardeners is other parts of the country are just putting their tomato plants in the ground, many Arizona gardeners are nearing the best time to harvest these juicy red, yellow, orange, and green orbs. Although we have a very long growing season, tomatoes can present some specific timing challenges. Tomato plants need a significant amount of water which can be difficult to maintain during the hot summer months. They also don’t do well when the temperature soars and even plants that survive are unlikely to produce any tomatoes during the hottest months of the year. Since tomatoes can have trouble surviving through the high summer heat, think about adjusting your growing season to start in the late fall or early spring and end as summer approaches. One way to avoid losing plants to the heat is to plan your growing season so that you have harvested all these beauties before the heat hits the triple digits. In order to thrive, tomatoes need the kind of nutrient rich soil that can be difficult to find in the desert. Give your tomatoes the best chance by supplementing the soil with compost, blood meal, and bone meal. Use the information provided on the blood and bone meal packaging to determine how much of each to add. This will ensure your soil has enough phosphorus, nitrogen, and other nutrients to sustain healthy, productive tomato plants. Tomato plants can grow very tall and the weight of the tomatoes can cause problems if the plants don’t have the proper support. There are several different options available including garden stakes and tomato cages. The key is to give the plant enough support so that the tomatoes can mature off the ground. This will help keep the plant healthy and minimize the potential for fruits to rot prior to being harvested. Tomatoes need a lot of sun but not too much heat, which can make for a tricky balance to achieve here in the desert. 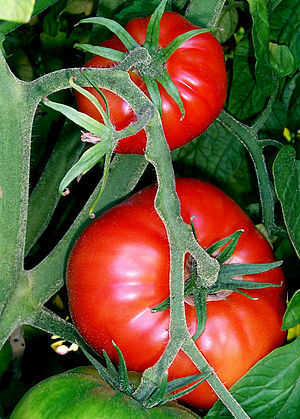 For the best result, plant tomatoes where they will get full sun in the spring and fall. To protect the plants during the hot summer months, use shade cloths or other methods to introduce a little shade during the hottest parts of the day. Once the hottest part of the year is over, you can return the plants to full sun. This entry was posted in Food Facts, Food Production, Vegetables and tagged Arizona, Fill Your Plate, Garden, gardening, Home, Plant, Soil, Tomato, Tomatoes, Vegetable. Bookmark the permalink.